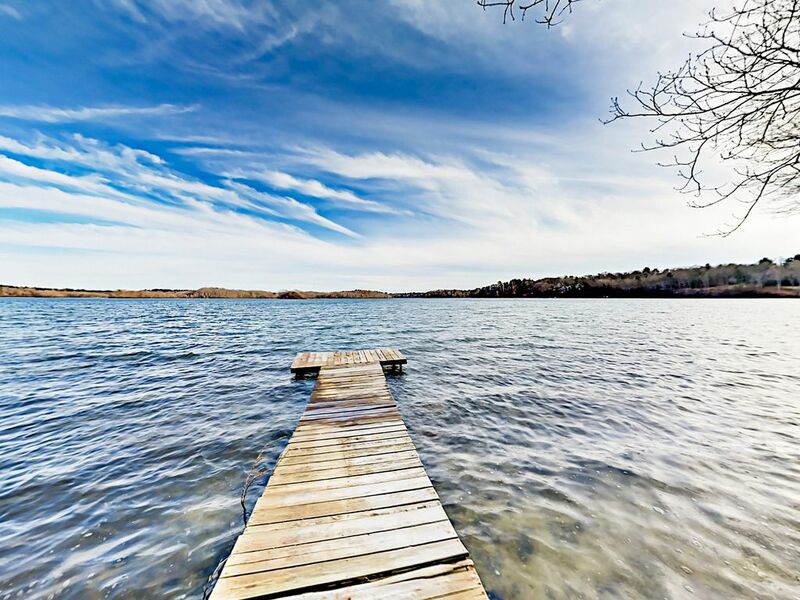 Mashpee Heaven provides rare access to one of Cape Cod's largest freshwater lakes. Enjoy swimming from a private pier and exploring the lake’s three islands, two beaches, and miles of trails. Centrally located, the 3BR/2BA cottage is a short drive to fantastic beaches and some of the Cape’s best shopping. Mashpee Heaven boasts gorgeous water views from a lovely sunroom and a large patio, air conditioning, and original hardwood floors. Serving as the social heart of the home, the sunny living area features water views and a wood-burning fireplace flanked by two comfy armchairs. Get cozy on two sofas and watch your favorite shows on the flat screen TV. From the main living area, French doors lead to the sunroom and patio, where you’ll find even more space to unwind, dine, and enjoy views of the lake. Whip up tasty dishes in the fully equipped kitchen with high-end appliances, ample cookware, and helpful gadgets like a coffee maker. When it’s time to eat, call the crew to a great choice of eating spaces, including the sunroom, patio, bar area, and table right off the kitchen. You're sure to rest comfortably each night in any of the three well-decorated bedrooms. One bedroom features a full-size bed, while another bedroom provides two twin-size beds and a sitting area with breathtaking views of the lake. A Jack-and-Jill bathroom with a tub/shower combination is shared between the two rooms. In the third bedroom, you’ll find two more twin-size beds and an office nook -- perfect for checking email or planning the day’s adventures. Around the corner, a guest bathroom is configured with a walk-in shower. At Mashpee Heaven, you will enjoy a lot of time right on the lake, which is just steps down from the cottage. Go for a swim in the delightfully fresh water, hang out on the private pier, or paddle across the lake in the kayak provided. Spend leisurely afternoons on the large patio overlooking the lake -- kick back with a cold beverage or fire up the grill and throw a family cookout. Other guest amenities include complimentary Wi-Fi, cable TV, a washer/dryer, a kayak, and parking for up to four vehicles in the driveway. Mashpee Heaven is right on one of the Cape’s best lakes. You can swim right from the private pier. The lake has also two public beaches, excellent fishing and a public landing for boats. For a day of hiking, kayaking, and splashing, simply paddle across the water to Lowell Holly Nature Reservation, which separates the two halves of the lake and can also be reached by a short drive. Just 15 minutes away by car, South Cape Beach State Park offers a scenic spot to relax, hike, and swim. When dining out, drive 5 minutes to Mashpee Commons to sample local flavor at upscale eateries like Bleu, Estia, and Trevi Cafe & Wine Bar. The house was in a perfect location for us between two sets of friends/family we wanted to visit (on the base and in Centerville). The house was a great layout for our family - we had 4 adults and two young children. Nice spacious kitchen, open living room and breakfast table, and then all that going onto the lovely screened in porch where we had our dinners! We had a blast walking down to the lake and having our coffee on the dock, and coming down in the late afternoons (after a day at the beach) to float in the chairs or just swim. It was a great anchor point for us as we moved around the cape. Lovely visit! On a side note - if you appreciate original fixtures - the house has a lot of neat old things (stove/oven, light fixtures, etc), but that have been maintained and work! Pretty cool! This is a "vintage" experience if you are one to enjoy that. The house has not been updated since the 1950's, and needs a bit of help. At the least, it needs new couches in the living room and a leaking faucet fixed in the bathroom. However, inspite of these drawbacks, the location is great and we discovered an amazing canoe to use on the pond. Has its own dock and lovely to enjoy the sun and swim in the pond just a few steps from the house. Negotiating with the Turnkey people was a nightmare-- the website wouldn't work for the last part of confirmation of identity-- said to call for help - we did and they wouldnt do it over the phone, said it had to be done online. The website wouldn't work on my computer so we had to go to someone elses, but then they wouldnt accept that because it wasn't my name on the computer. On and on. Finally they accepted my husband's computer and it took ages to do it because turnkey insisted on trying again through the computer and it didnt work again. My husband had to do a complicated workaround. If he hadn't been so computer savvy we would have had to cancel --The Turnkey rep's suggestion. It all took ages and there was NO flexibility on the part of the turnkey rep. Really a waste of time! HOWEVER The spot is beautiful and VERY private. Great screen porch. High trees, Crickets at night. A long walk down a steep hill to the water. ( NOt for someone with bad knee or ankle. NOt railing on last steps down). Motorboats come quite close to shore. Don't swim out to the middle! House is lovely - '50's era with nice decoration and great sheets and towels. Good beds. Windows on the uphill side don't have screens so can't get good cross-ventilation. So no air unless you turn air -con on. Windows stuck. Porch door wouldn't lock so basically house wasn't secure. porch furniture very old and quite dirty. S0meone had cleaned the arms of chairs but not the legs or backs. We put towels down on the porch dining table chairs to sit on them. Beautiful getaway in a great location! We had a wonderful stay!! The home is in such a beautiful and quiet location, and we arrived to a clean and well kept home. We LOVED walking down to the private dock and enjoying the wonderful views. The screened in porch was perfect for enjoying our meals within the lovely scenery. I would definitely stay at this property again! The home is great for a family of 4-6 people. The rental was very clean and the location is wonderful. So quiet and serene and we loved looking at the lake. We spent a lot of time on the deck and also in the sun room. The decor could use some updating but overall it was acceptable. The one real issue with the property was the deck needs to be repaired.